NEWS: workshop in London coming up on there 1st of June! The Fort Processor is an experimental noise synthesiser and audio effect circuit designed by UK harsh fun noise duo ISN’TSES (Tim Drage & Lisa McKendrick) for Fort Process sound art festival 2018. This event takes place in the tunnels and bunkers of Newhaven Fort on the Sussex coast, and the electronics and artwork of the synth are based on the layout of the site, with inspiration from the surrounding landscape and ocean. 1. The audio input, (3.5mm) used to connect devices such as a radio, walkman, phone, tablet, mp3, instrument etc. This signal is distorted using high gain then run through a frequency divider to add two noisy sub-octaves. When no input jack is connected, the circuit feeds back and self-oscillates. 2. Squarewave oscillators pitch-controlled by a Light Dependent Resistor located at the top right of the PCB. This LDR can be played by moving lights near it or by blocking the light. 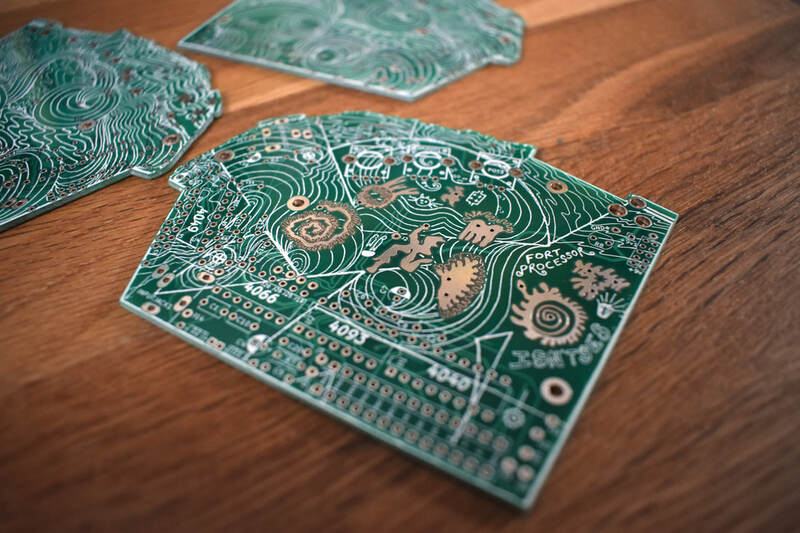 The resulting sound can be further modulated by the touch pads which are the metallic drawings across the middle of the circuit board. Touch two or more of these at once to alter the sound. This can be understood as a live circuit-bending effect. 3. A variable-speed chopper, controlled by the 2nd knob. This rapidly slices between the distorted input/feedback signal and the light-controlled squarewaves. Turning the knob changes the speed, creating various ring-modulation, tremolo and cut-up effects. 4. A bass oscillator/filter/beat/drone generator, mutated from the classic ‘Twin-T’ analog kick drum circuit. This is triggered and influenced by the audio input and is controlled by the 1st and 3rd knob in conjunction with the trimmer pot. Knob 1 controls the decay envelope; turned anticlockwise this produces more percussive sounds, while turning it clockwise makes bass drones. When turned fully-clockwise it gets quiet to allow the other noises to cut through. The 3rd knob and the trimmer pot interact with each other to control the pitch of this section. The trimmer can be gently turned with a small screwdriver and can be viewed as a tuner to achieve either a resonant drum-like sound, or a more continuous bass tone. The trimmer should be tweaked before playing according to each users personal preferences. Expect random and unpredictable results from this section according to how the rest of the sections are influencing it. The Fort Processor is powered from a 9v DC, centre-negative power supply, ie a BOSS-style guitar pedal PSU. Other polarities or voltages will almost certainly damage/destroy the circuit, requiring at least the ICs to be replaced, so be careful! It is possible to wire up a 9v battery too, contact us for info on this. Completed version of the circuit. Not currently available, we may make more in future. We will also consider possible trades of a PCB for other interesting diy synth/eurorack/noise stuff, let me know any offers. Let me know any questions More demos etc soon. 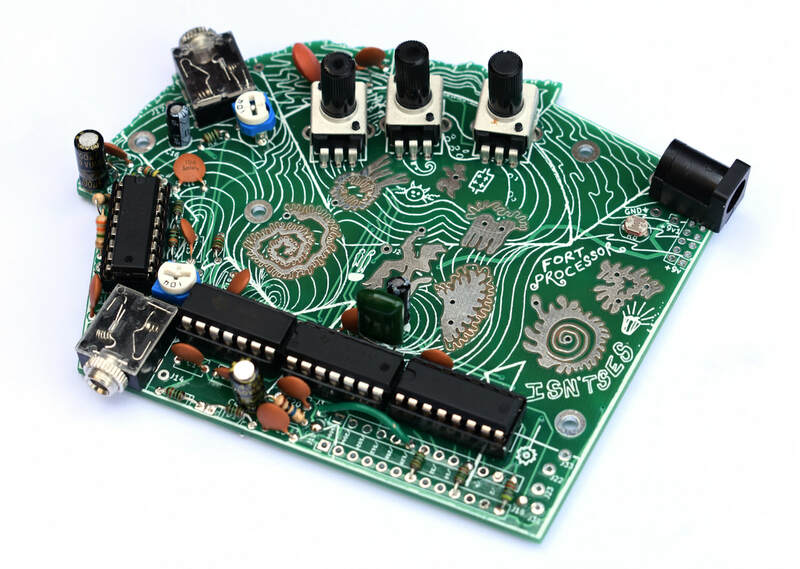 We will be demoing the Fort Processor at the next CV Freqs - https://www.muffwiggler.com/forum/viewtopic.php?t=212832 - and bringing some PCBs with us, if anyone wants to get hold of one. We are doing another workshop, this time in London at IKLECTIC (right near Waterloo station) on the 1st June. 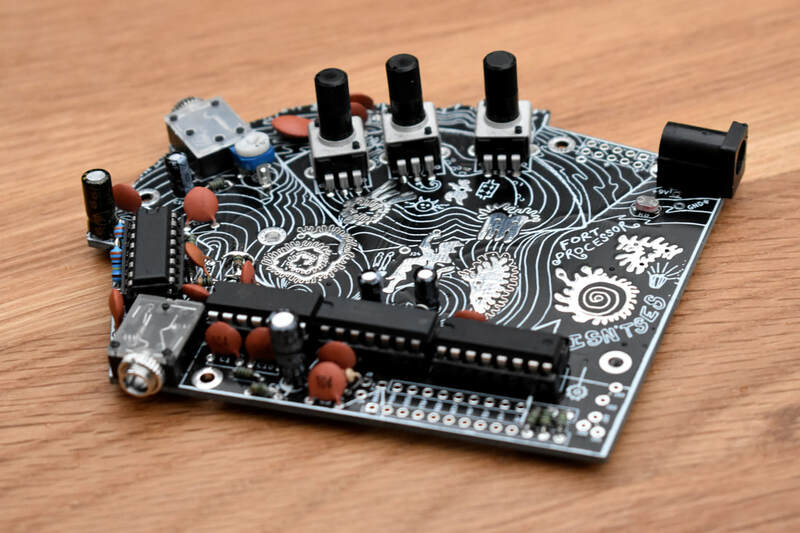 The workshop runs from 11am for about 3 hours, and is suitable for complete beginners to soldering as well as more experienced synth builders/circuitbenders.